Hashem created and formed the creation using the letters of the aleph bet. 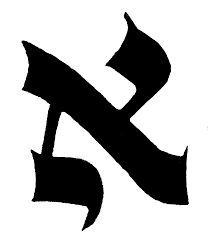 A hint of this can be seen in the first letter of the aleph bet. All letters have a gematria (numerical value) and we learn more about the Torah by investigating these values. The first letter, the aleph, has the numerical value of one. We know that Hashem is One, but the One that Hashem is is not the one as in one, two, three…. It is the One as in Only. The aleph is made of an upper yud, a vav, and a lower yud. This hints to the way of creation. The upper yud has been folded over diagonally (brought down) making the vav as the fold. Across from where the upper yud now lies there comes the lower yud. Aleph has the gematria of one and Hashem is One. Yud vav yud has the gematria of 26. Twenty-six is the gematria of Hashem's most holy name, Yud Kay Vav Kay. The Torah teaches us that there is nothing other than Hashem. [i] He is the One, He is the all, but in order for creation to appear He has to hide Himself so there can appear to be an other. It is the Jew's job to reveal Hashem's Presence by using His creation for Holy purposes.